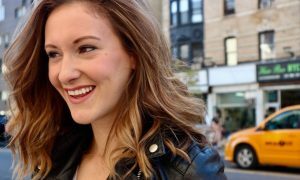 Last year, 17-year-old Sheridan Hancock was named Activewear Ambassador for Energetiks after winning the company’s model search. Since then, she has become used to making the five-hour round trip from Great Western in country Victoria to the Melbourne headquarters of Energetiks to get the model treatment. Currently a student at Dynamic Dance Studios in Ararat, Sheridan believes the time and effort she puts in as ambassador is worth it, and not just for the hair and makeup. She’s well aware of the fact that, compared to the hours put into the range’s development by the Energetiks team, her day in front of the camera is but the final step in a long process. 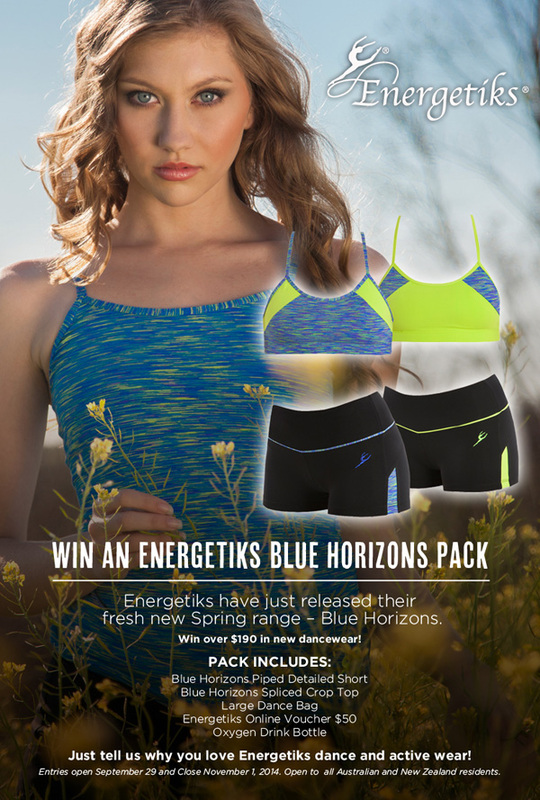 Sheridan models Energetiks’ Blue Horizons range. 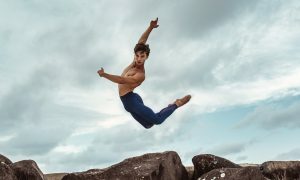 To bring to life a fresh and dynamic range like Blue Horizons, all departments – design, production and marketing, work together closely to evoke spring – not just in the abstract, but with an intimate understanding of how dancers experience feelings through their bodies. Karen herself danced for many years until she was 26, and all members of the design and pattern-making team have a significant dance background. “Having that sense, as a dancer, of what a dancer wants, that’s so important to us”, says Karen. While Karen emphasises the importance of the company’s collective dance background to its success creating dance activewear, Sheridan feels equally that the right outfit can contribute to success in the studio. “If you feel pretty, you’re going to dance pretty. Wearing the right practice clothes can definitely affect your experience in class.” She’s grateful that her studio allows its students to wear what they want, which means there’s always plenty of scope to experiment with practice clothes between her ballet, tap, jazz and contemporary classes. Her dance outfits also double as gym or running outfits, reflecting her broader interest in fitness and the body. 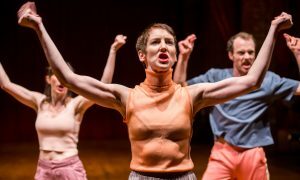 Although Sheridan doesn’t feel she is destined for a professional dance career, she has hopes of some day becoming a physiotherapist for a dance company to “stay involved in dance through the other side of things”. To see the gorgeous new Blue Horizons range, go to www.energetiks.com.au. To WIN a Blue Horizons Pack enter here! Photo (top): Sheridan and young dancer Jacinta, model Blue Horizons.